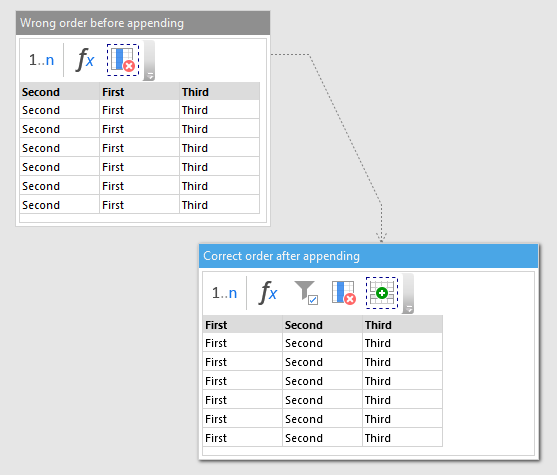 We can use the fact that Append Table transformation keeps the order of column of the primary table. 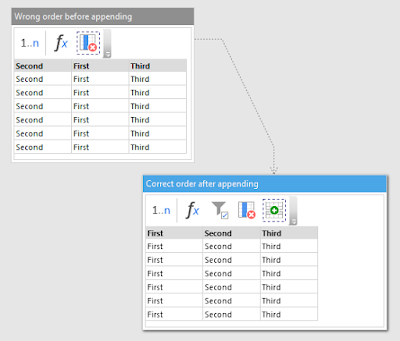 This transformation matches column names in the primary table and the external table (the one which is appended). Columns of the external table with matching names are appended at the bottom of the primary table's columns. Non-matched columns are added after last column of the primary table (if this sounds complicated to you -- take a look at examples in web-help for Append Table). Step 1. Create an empty table with columns in the right order. Step 2. Append our table to that empty table. 1. Use Sequence transformation to generate a table with 1 row. 2. Use Calculate new columns transformation to create new columns in the right order. 3. Remove the only row using Filter. 4. Remove column [Count] using Remove Columns. As you can see, the columns are now in the right order.